Coming soon: Brunchables, for when you want Lunchables at 10 a.m. It sounds like a late April Fool’s prank, but it appears to be real. Kraft Heinz announces they’re coming out with an earlier version of Lunchables, called Brunchables. These new kits offer build-your-own breakfast sandwiches out of flatbreads, cheese, and ready-to-eat breakfast meats like sausage, ham and bacon strips, along with a mini-blueberry muffin for brunch dessert. As usual, we have questions. Lunchables first came out in 1988 and has since been a popular D.I.Y. option for kids who hate their school lunch. Will those same kids be as into Brunchables breakfast sandwiches as they are into Lunchables Pizza and Nachos? 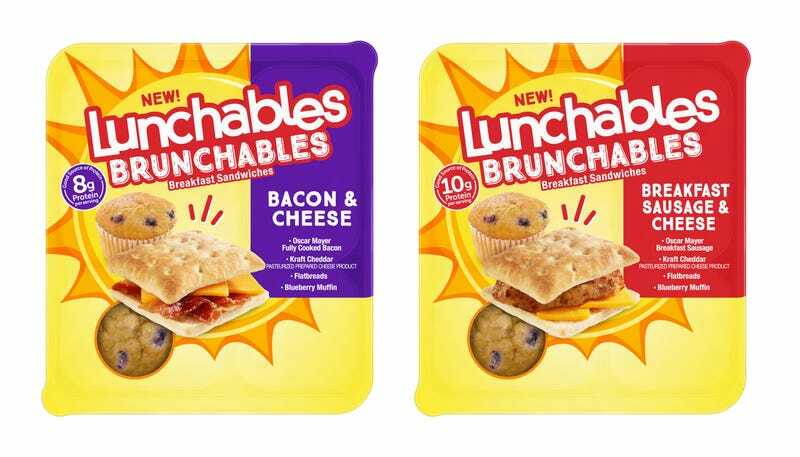 Despite Kraft Heinz marketing director Zach Meyers’ statement in the press release—“For years we’ve seen fans ask whether or not Lunchables would create a breakfast version. We’re excited to finally unveil Brunchables, an exciting new choice at breakfast that helps start kids’ days off right”—as a mother, I’m skeptical. And as far as degree of difficulty of meals goes, kids’ breakfast is the easiest one. Toaster waffles, cold cereal, or instant oatmeal, ideally with some fruit. I am all about convenience, but Brunchables is not a product that a busy mom like myself has been craving (and I’m not counting the blueberries in the muffin as a fruit serving). Eh, I’ve been wrong before. But if not kids, who, then, are Brunchables for? The office worker who wants second breakfast around 10:30? Actually, that could probably work. BUT. The turkey and ham inside Lunchables are palatable with the accompanying crackers and cheese. Something about room temperature or cold sausage and bacon squicks me out. Maybe I am wrong about lukewarm breakfast meats—and I have been known to snack a no-longer-hot sausage link or two from the buffet—but it doesn’t sound that appealing. There’s a tight-rope thin margin for appealing, room-temperature breakfast sausage. Sausage and bacon are fattier than cold cuts, and when the grease congeals, it’s like you’re biting into a chapstick. The question is whether Brunchables’ sausage and bacon can walk that razor’s edge. We haven’t tried this yet, but we’ll report back when we do. Brunchables are scheduled to hit stores in April. What do you think, Takeout commentariat? God’s gift to packaged food or a gimmicky product that may disappear before the year is out?